In the fairy tale of stone soup, clever strangers trick a village into creating a hearty meal with them. The key to this story is that the villagers are convinced that they have no food to share, but are able to find just a little something to add to the soup to help finish it off. When we think of our own kitchens in that way, always saving just a little for the soup, we can end up with quite a tasty broth. In practice this can be quite easy. 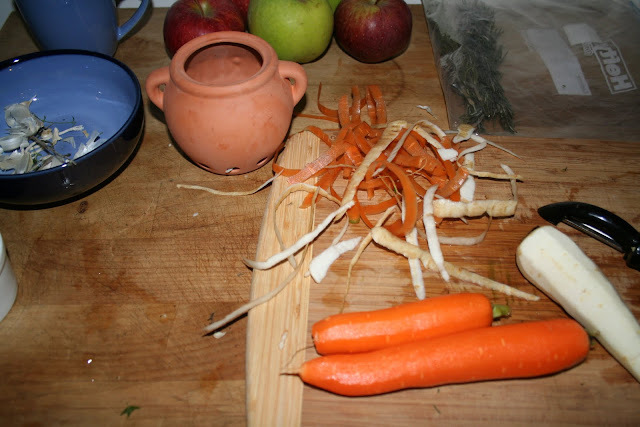 Traditionally, you make a broth with whole vegetables - a few carrots, onions, stalk or two of celery. But why whole vegetables? Why not parts of vegetables? Why not the parts of vegetables you were planning to throw away anyway? Even better, why not the parts of vegetables you were planning to throw away that happen to carry the most nutrients? WOW! What a two-for! Here's the key, whenever you are cleaning and cutting up vegetables, save all the scraps and put them in a one gallon ziplock bag in the freezer. I typically keep a bag of carrot, onion, and celery parts in one bag. This with a chicken or turkey carcass and a few sprigs of fresh herbs makes an standard poultry stock. But don't stop there. Keep all the scraps of beets, winter squash, potatoes, and any other vegetable you may use. Beets add natural depth of color and flavor. Potatoes are a natural thickening agent. And winter squash adds just a touch of sweetness. Balance that with some fresh herbs like thyme and rosemary and you've got an amazing, rich stock for vegetarian dishes. Just keep putting scraps into their respective bags until they fill up. Then, dump the scrap vegetables into a stock pot with a tablespoon of olive oil over high heat. Sauté for about ten minutes, preferably browning the veggies just a little. Then add a meat carcass (optional) and herbs along with about 8 cups of water, a tablespoon of salt, and a tablespoon of peppercorns. Simmer for at least two hours adding more water occasionally, keeping the water level constant. Strain the stock through cheese cloth to remove all the vegetables and meat. At this point, you can take the time to pull out any meat that might have fallen off the bone. I'm always surprised that I tend to find about a cup of really yummy meat. However, this is not a pretty part of the process, so I will spare you any pictures. Now you've completely gotten everything out of your scaps and can feel pretty confident tossing them into the compost bin. 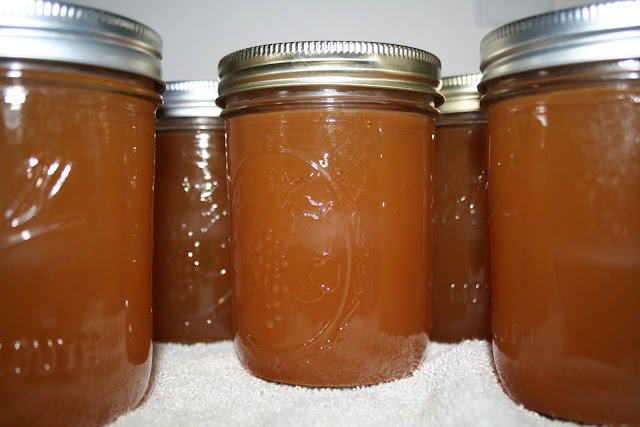 Refrigerate the stock over night. Strain any fat off the top. Then you can either pour the stock into containers in the freezer (I like to use 2 cups as a useful serving size) or you can can it. 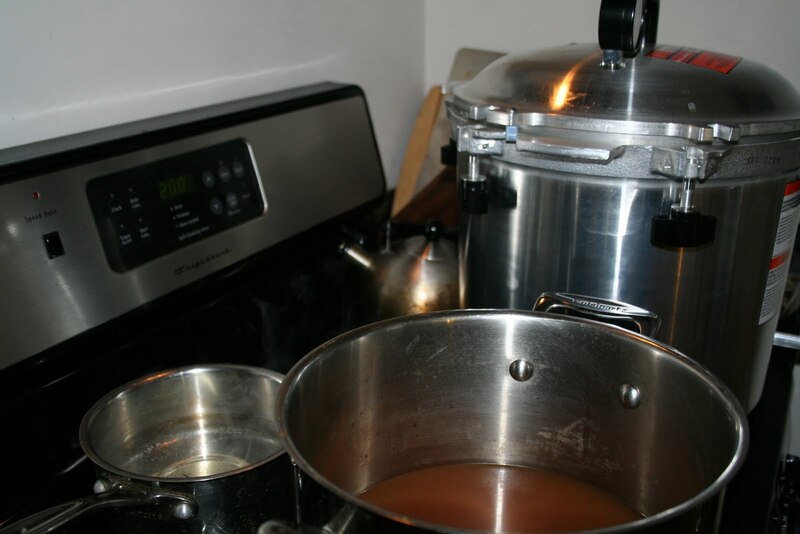 Since stock is a low acid food, you will need to pressure can it, which requires special equipment. (Make sure to carefully follow the directions and canning times for canning stock that comes with your canner.) After sanitizing the pint jars and boiling the stock for ten minutes, put the stock in the pint jars and process in the pressure canner. Trust me, it is so rewarding to take stuff you would have thrown out and make something magnificent out of it. Now, any time you need a little more umph in a recipe, you've got your very own stock in the freezer or pantry.